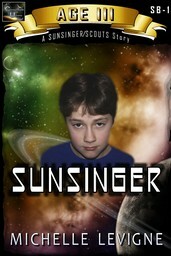 Welcome to the adventures of SUNSINGER -- a 10-book YA series set in Age 3 of the Commonwealth Universe. SUNSINGER chronicles the adventures of Bain Kern, an orphan boy on a backwater colony world. When his colony is endangered because it lies in the path of an invading alien fleet, everyone is evacuated. 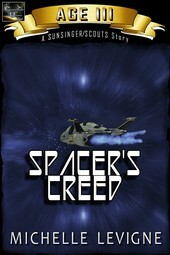 Bain steps on board the small Free Trader ship Sunsinger, captained by Spacer captain Lin Fieran. His life is immediately changed, and as he learns his heritage and grasps the opportunities offered him, Bain grows into the man who will create the Scout Corps, destined to protect the Commonwealth. Other Commonwealth novels deal with his descendants, including the books in the Chorillan Cycle. More books about Bain's early days as commander of the Scout Corps are planned. Come on board for the adventure! Orphaned and now evacuated from the only home he's ever known, Bain's dream of becoming a Spacer is suddenly more possible than he ever realized. Aboard a small Free Trader ship with a forceful, yet caring and quirky captain, Bain learns the ropes of combat and courage. Battling not only the threat of the Mashrami, the human race's biggest enemy, but Bain must battle his own enemy as well--a bully who prefers Bain over a punching bag. Will he be able to prevail, using his innate Spacer genes and all that the Captain has taught him, to win the war against all of his enemies? Bain's prayers were answered: Captain Lin Fieran wanted him to stay on Sunsinger and be her crew for another evacuation trip to Lenga. When they got there, everyone had already been evacuated, so they went to the next world in the path of the Mashrami invasion. That's when things got complicated by pirates and by people who didn't want to leave their homes. To make matters worse, Bain knew Lin wanted him to stay on Sunsinger with her and Ganfer, just as much as he wanted to stay, but someone in authority was getting in the way. Lin had to keep a secret from him, and if she told him what it was, he might never be allowed back on board.